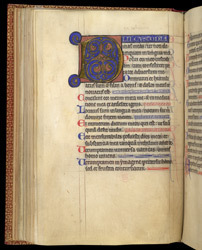 Mid 13th-century St. Albans is crucially important in the history of English illuminated manuscripts thanks primarily to the works of Matthew Paris, a monk of the abbey. Many manuscripts have been--probably wrongly--attributed to the abbey by comparison with Matthew's style and technique; this psalter is therefore important because its claim to be a St. Albans product (based on the calendar, litany, and early ownership by a St. Albans monk) is secure. This initial 'D' marks the start of Psalm 38. In the upper margin one can see that the scribe, who would have left a blank space for the artist to fill, wrote a leadpoint note ('ixi custodiam') to instruct the artist exactly what letters had to be included in the decoration. The artist followed these instructions, writing in white on the blue panel below. Elsewhere in the manuscript the artist failed to follow such instructions.